When Harry Rawlins (Liam Neeson) and his crew steal $2 million from local Chicago hood/wannabe politician Jamal Manning (Brian Tyree Henry), the heist goes wrong, leaving Harry and his men dead. Manning wants his money back, so he and his brother Jatemme (Daniel Kaluuya) go to Harry's widow, Veronica (Viola Davis) and threaten her to return the money or else. 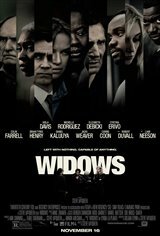 Veronica rounds up the widows of Harry's gang, including Alice (Elizabeth Debicki), Linda (Michelle Rodriguez) and Belle (Cynthia Erivo), and offers them a deal. She has Harry's detailed journal of his heists, including the next one on his list. She offers them a split of $3 million if they'll help her pull off the $5 million heist Harry had planned.